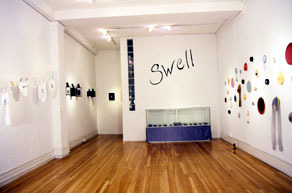 Swell is a humorous and glamorously serious take on femininity, its illusions and its power in the 90's. 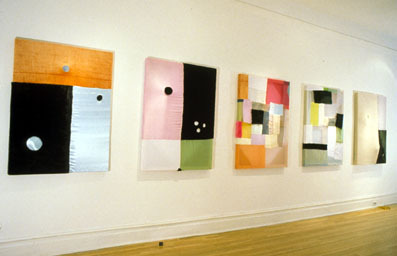 1996, 48" x 36"; fabrics (velours, fake furs, satins and chiffons) over wire armatures on wood stretcher bars. In Swell, Amy Berk creates skin-like constructions by binding together fake-furs, translucent chiffons and silky satins and stretching them over wood frames. (and embroidery hoops) These structures serve to reveal amd conceal what is seen on the outside epidermis and what is hidden underneath. Through veiling and unveiling the bumps, lumps, swellings and holes of these hides, Berk pieces together the fragments of femininity. this project was created for an all woman bacchanal of the same name that happened in the alternative space ACME in March of 1996.
very tasty! and all within a hans hoffman formalist structure.